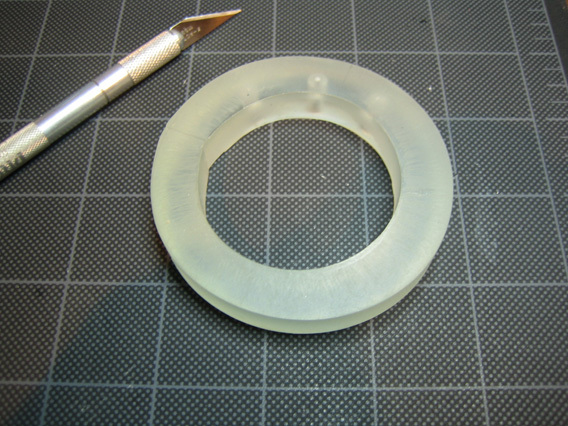 The first item to attack is the semi-clear ring that forms the foundation for the reactor. I looked into having clear acrylic milled (something for which I lack the tools) but most of the quotes I received were at least $60 each. I’d wanted to try casting polyester & epoxy resins for some time so I decided that this would be a good time to learn that skill. Most of the casting methods I explored were expensive and toxic. Since winter temperatures were forcing this project indoors I decided to go with epoxy resins. My first attempt, after creating a plastic mold negative used a vegetable-based oil as a mold-release. Major failure. The epoxy resin, normally clear, leached moisture out of the veggie oil and fogged the resin. As it turns out, moisture is the number one enemy of epoxy resins. Lesson learned. I then obtained some mold release made by the same company that makes the epoxy. 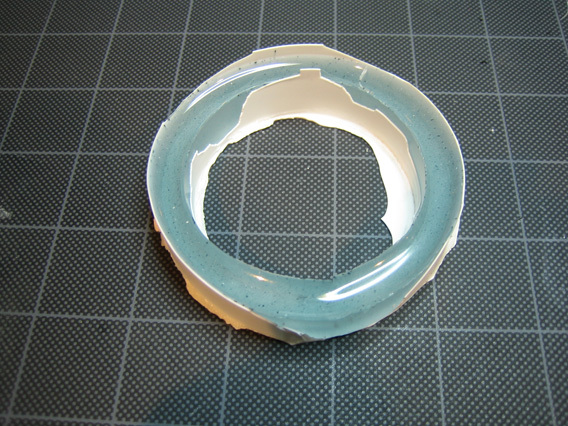 This failed to release from the plastic mold. What a mess…. You can also see some chunks of color from tinting that I added. During curing, the tint clumped together.